If you haven't already done so, please sign the petition (here) to stop the Scottish Air Gun ban. Another 5000 signatures are needed, so please pass the word around. You think a yank signature would help or hurt? If it will help -- I'll sign straight off. 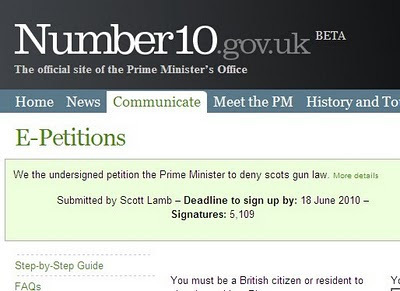 I'm sure that the beleaguered Scottish air rifle hunters would be very appreciative of your support but, sadly, a UK postcode is needed to vote in this petition. Thanks, though! Well I am still a British citizen with a British passport, so I have signed it. I seem to recall they did this to the Scots a few hundred years ago, and more recently banned the carrying of the traditional dirk! Curiously though, I think that it's the Scots doing it to themselves - it wouldn't be an imposition of English Law, it'd be a decision of the independent (because devolved) Scottish Parliament. I have an idea that it's a reaction to accidents and abuse of air guns in the inner cities up there coupled with the (terrible beyond words) memory of the Dunblane massacre there. With my more pessimistic head on I tend to think that it will go exactly the same way in England before too long. It's already a tenet of the Green Party manifesto here to completely outlaw what they refer to as 'unlicensed' air gun ownership. I suppose it's also an indicator of extent to which population and therefore voting clout is concentrated in urban area - people in urban centres don't really have much idea of the responsible hunting culture that exists beyond their city boundaries and so can't really see why such a thing as air guns ought to be legal. Perhaps that's a real thing that we 'Outdoor Bloggers' do contribute - the testimony that intelligent life does indeed exist beyond the reach of the Starbucks wifi signal.